Roopkund (locally known as Mystery Lake, Skeletons Lake) is a high altitude glacial lake in the Uttarakhand state of India. It lies in the lap of Trishul massif and is famous for the hundreds of human skeletons found at the edge of the lake. 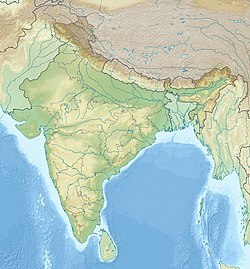 The area is uninhabited, in the Himalayas at an altitude of 5,029 metres (16,499 feet). Surrounded by rock-strewn glaciers and snow-clad mountains, the lake is a popular trekking destination. Skeletons were rediscovered in 1942 by a Nanda Devi game reserve ranger Hari Kishan Madhwal, although there are reports about these bones from the late-19th century. At first, British authorities feared that the skeletons represented casualties of a hidden Japanese invasion force, but it was found that the skeletons were far too old to be Japanese soldiers. The skeletons are visible in the clear water of the shallow lake during a one-month period when the ice melts. Along with the skeletons, wooden artifacts, iron spearheads, leather slippers, and rings were also found. When a team from National Geographic magazine retrieved about 30 skeletons, flesh was still attached to some of them. Geneticists Niraj Rai and Manvendra Singh at the Center for Cellular and Molecular Biology at Hyderabad conducted DNA tests on a hundred samples from the lake and compared them to the current Indian population. Results indicated that 70 percent of them had an affinity with Iran, while the remaining ones belonged to the local population. It is hypothesized that the Iran group took the help of local porters to seek new land for settlement. Later studies placed the time of mass death around the 9th century CE (1,200 years old). Remnants belonging to more than 300 people have been found. Radiocarbon dating of the bones at Oxford University's Radiocarbon Accelerator Unit determined the time period to be 850 CE ±30 years. The Anthropological Survey of India conducted a study of the skeletons during the 1950s and some samples are displayed at the Anthropological Survey of India Museum, Dehradun. Genome-wide DNA study of skeletons from Roopkund by Harney et al. 2018 revealed that the skeletons belonged to two distinct groups; one group is composed of individuals with broadly South-Asian related ancestry from 9th CE, and the second group is composed of individuals from 200 years ago with genetic affinity with east mediterraneans. The studies of the skeletons revealed a common cause of death: blows to the back of the head, caused by round objects falling from above. The researchers concluded that the victims had been caught in a sudden hailstorm, just as described in the local legends and songs. There is a growing concern about the regular loss of skeletons and it is feared that, if steps are not taken to conserve them, the skeletons may gradually vanish in the years to come. It is reported that tourists visiting the area are in the habit of taking back the skeletons in large numbers and the district administration has expressed the need to protect the area. The district magistrate of Chamoli District has reported that tourists, trekkers, and curious researchers are transporting the skeletons on mules and recommended that the area should be protected. Governmental agencies have made efforts to develop the area as an eco-tourism destination in an effort to protect the skeletons. Roopkund is a picturesque tourist destination and one of the important places for trekking in Chamoli District, Himalayas, near the base of two Himalayan peaks: Trisul (7,120 m) and Nanda Ghunti (6,310 m). The Lake is flanked by a rock face named Junargali to the North and a peak named Chandania Kot to the East. A religious festival is held at the alpine meadow of Bedni Bugyal every autumn with nearby villages participating. A larger celebration, the Nanda Devi Raj Jat, takes place once every twelve years at Roopkund, during which Goddess Nanda is worshipped. : Roopkund lake is covered with ice for most of the year. 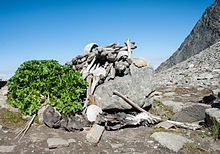 Roopkund's skeletons were featured in a National Geographic documentary, "Riddles Of The Dead: Skeleton Lake". ^ a b c d e Alam, Aniket (29 June 2004). "Fathoming the ancient remains of Roopkund". The Hindu. Retrieved 29 May 2013. ^ Kohli, M.S. (2000). The Himalayas : playground of the gods : trekking, climbing, adventure. New Delhi: Indus Publishing Co. p. 79. ISBN 9788173871078. ^ Sati, Vishwambhar Prasad; Kumar, Kamlesh (2004). 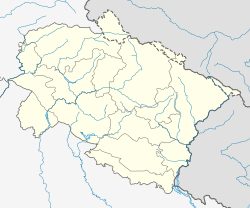 Uttaranchal : dilemma of plenties and scarcities (1st ed.). New Delhi: Mittal Publ. p. 82. ISBN 9788170998983. ^ a b c "Skeleton Lake of Roopkund, India". Atlas Obscura. Retrieved 25 October 2016. ^ "Roopkund lake's skeleton mystery solved! Scientists reveal bones belong to 9th century people who died during heavy hail storm". India Today. 31 May 2013. Retrieved 12 June 2013. ^ Hari Menon (8 November 2004). "Bones Of A Riddle". Retrieved 31 May 2013. ^ "The Intersection #5: Unearthing mysteries of the Harappan civilization". The Intersection podcast. ^ "National Geographic expo solves Roopkund skeleton mystery". Deccan Herald. 30 October 2004. Archived from the original on 14 May 2014. Retrieved 29 May 2013. ^ a b "Roopkund's human skeletons go missing". Deccan Herald. 24 September 2007. Archived from the original on 28 January 2015. Retrieved 31 May 2013. ^ Vicki, Pomeroy (2007). Deep in the Indian Himalaya. Garhwal Publishing. p. 63. ISBN 9780615156972. ^ a b Kazmi, SMA (12 November 2007). "Tourists to Roopkund trek back with human skeletons". The Indian Express. ^ "8th International Symposium on Biomolecular Archaeology" (PDF). isba8.de. ^ "Roopkund skeletons 200 years old". ^ "Skeletons:AWOL". Satesman 16.7.2005. uttarakhand.org (Govt. website). Retrieved 30 May 2013. ^ Kazmi, SMA (5 February 2009). "Roopkund's skeletal tales". The Tribune. Retrieved 30 May 2013. ^ a b Nigam, Devesh (2002). Tourism, environment and development of Garhwal Himalaya (1. ed.). New Delhi: Mittal Publ. p. 28. ISBN 9788170998709. ^ "Skeleton Lake". Miditech.tv. Archived from the original on 6 February 2012. Retrieved 2 June 2012. Aitken, Bill. The Nanda Devi Affair, Penguin Books India, 1994. ISBN 0-14-024045-4. Wikimedia Commons has media related to Roopkund. This page was last edited on 20 April 2019, at 20:06 (UTC).